4 Live Sessions Presented Over 3 Hours on December 4 & 11. Bridged with Online Workshops and Discussions. Led by librarians and designers who have used design thinking in their libraries to create new programs and meet user needs, Demystifying Design Thinking is an introductory online workshop designed for library professionals and teams who want to take a fresh approach to tackling their library’s real-life challenges through human-centered design, also known as design thinking. From space planning for all corners of the library, to redesigning services and staffing, to developing a more user-centric, community-minded approach, design thinking can help you problem-solve through ingenuity and creativity, and better understand and serve your patrons. This four-session introductory workshop draws upon the at a glance guide to design thinking developed by IDEO, an award-winning, human-centered global design firm, in collaboration with the Chicago and Aarhus Public Libraries. 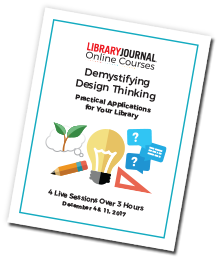 The program will provide an introduction to the process of design thinking, as well as resources to help you begin to put it into practice in your library in 2018. This workshop does not require pre-existing knowledge or experience with design thinking. All participants will be given the tools and information needed to walk away with ideas to emulate, regardless of its size or budget. Attendees are encouraged to come as a group for a team-building experience! Contact us for group rates. Librarians and educators interested in introducing design thinking to help solve problems at their library or within a team or initiative. The course content will be relevant to librarians in school, public, and academic libraries. Participants will walk away with a plan for how to begin applying human-centered design at their library. Engage with presenters via live video stream, visual presentations, and chats. You’ll workshop practical ideas in groups with guidance from an advisor to map out your own plan. We welcome you to class and provide insights into the course structure, speaker program, and assignments to help you get the most out of class. What is Design Thinking and Why Should You Care? This highly creative approach to problem solving is gaining popularity in libraries as they plan for what lies ahead. Human-centered design, also known as design thinking, focuses on defining and then resolving concerns by paying attention to the needs, aspirations, and wishes of not only patrons but staff, administration, and all members of the community. Design thinking is not simply solution-oriented but service-oriented. You will learn to recognize the step-by-step components of how customers use library services and programs—and then brainstorm, prototype, iterate, and ultimately make them better. Libraries are all about getting feedback from their patrons. But usually it’s from a library-centered point of view—how satisfied patrons are with their existing experience, or what else they consciously want from the library. Design thinking, on the other hand, uses a more human-centric approach. It gets at what users truly need, to design a service that will give users what they didn’t know they wanted from the library—or didn’t know that the library could deliver. But it takes knowing how to listen to customers, observe their behaviors, ask the right questions, and take the time to think through their journeys to make those changes. Key to design thinking is the ability to move quickly to a fast, inexpensive tryout of the basic concept, sometimes multiple times, before it gets rolled out at scale, rather than heavily investing time and money into perfecting a project before it makes first contact with the public—and then it’s too late to change. From making ideas visible using the simplest of materials to collecting actionable feedback, design thinking uses an iterative process to highlight what parts of an idea are great and what needs to change—to “fail faster” until you end up with a winner. Staff involvement is one of the most important aspects of design thinking—both in the planning process and for developing a cohort with the ability to lead teams of their own. Most library leaders encourage innovation among staff, and educating them in human-centered design helps ensure that the ideas they come up with answer real needs, further the library’s mission, and allow their fellow employees to tap into the methods as well. As design thinking finds its way into more library and information science programs, librarians are starting their careers with the practice in mind—and directors are making sure it’s on their radar as well.